Team Brunel won the Volvo Ocean Race's excruciatingly drawn-out Team Vestas Wind In-Port Race Itajaí today when a lack of breeze tested the sailors' patience and seamanship to the full. The very hard-earned victory takes the Dutch boat to the top of the in-port race series overall standings on 15 points, now one point clear of second-placed Abu Dhabi Ocean Racing. For so long this morning it was not clear if the packed docks of fans in Itajaí would even see an in-port race, with wind pressures barely passing three knots. Race management postponed the start for 10 minutes before the boats were finally able to cross the start line. MAPFRE were happy simply to make it to the race course, after their shore team and the race’s Boat Yard crew were forced to work all night to reinforce a section of their mast, around the spreader root to ensure the rig was robust enough. Team SCA was the first to show in the shortened, two-lap, four-leg contest as they chased their third win in the in-port series, and second in a row after their success in Auckland. They narrowly reached the first gate ahead of overall race and in-port series leaders, Abu Dhabi Ocean Racing, with the all-female crew and Emirati crew opting for different sides of the course. 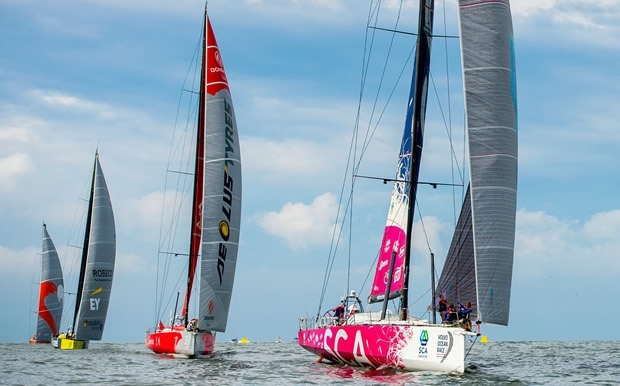 The pair completed lap two virtually neck-and-neck all the way as they desperately sought the little wind pressure Itajaí was offering on an overcast, but bright early afternoon. Slowly but surely, however, the crew of Azzam began to eke out an advantage over the women, but then the wind dropped completely and the entire fleet slowed to a virtual standstill. Team SCA had been hit with a 360° penalty turn for fouling, but suddenly moved from the back of the fleet into second place. The Dutch crew on Team Brunel then took their turn to feel total frustration as the wind deserted them allowing Dongfeng Race Team to claim the pace. With the finish at last in sight, Abu Dhabi Ocean Racing, Team Brunel and Dongfeng Race Team found themselves in a dead heat driftathon for the lead, alll still struggling desperately to find pressure. Finally, Bouwe Bekking's team shook off what they must have felt was concrete from their hull to win their first in-port race of this Volvo Ocean Race. Azzam eased past Dongfeng for second with Team SCA pipping MAPFRE for fourth and Team Alvimedica settling for sixth. "This is a great boost for the team," said Bouwe Bekking. "It's always good to start a leg with a victory. The boys have worked extremely hard. After the last gybe and when we crossed in front of Abu Dhabi Ocean Racing I already felt that we could win. We have sailed a good race and this time the luck was on our side." Crewman Pablo Arrarte added: "It was a tricky in-port race. There was almost no wind, so then it's hard to keep the boat running. The wind that was there was not stable and shifted in all directions. We have sailed quite conservative and we only concentrated on our own race. At the end, we have taken a risk to choose for the left side of the race track. We did not know whether this would be the right choice. Luckily this proved to be the right decision and we could win the race. This victory is good for the confidence." Bearing to gate bottom gate: 270 for the first lap move to 050 for 2nd rounding. Distance 1nm, 3 laps shortened to 2 laps.